So who is the Flavor Guy? 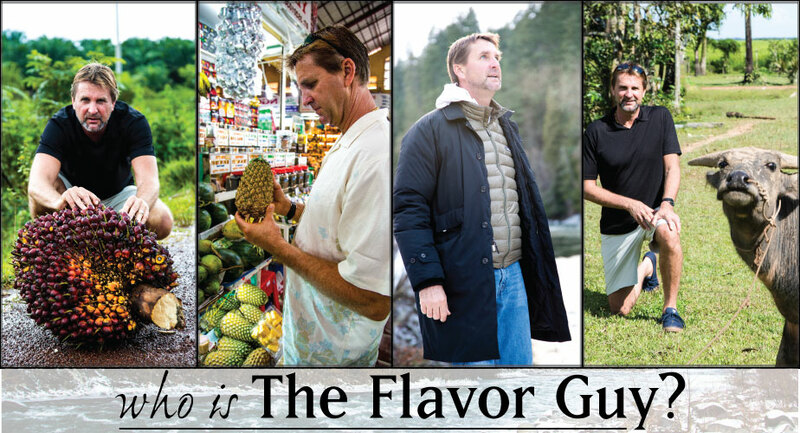 The Flavor Guy is Bill Sabo, the CEO of Natures Flavors. The Flavor Guy first started creating flavors in his garage at the ripe age of 17 years old. He created flavors using techniques he learned from his great uncle and grandfather, and discovered that the creation of flavors was something he was passionate about. His passion for flavor and using natural ingredients has lead him to find the true meaning of what flavor is by traveling around the world exploring remote places, seeking the raw materials that make up our flavors. The Flavor Guy is now sharing his story while his adventures exploring the world for the essence of true flavor continues. Let’s get to know who The Flavor Guy is. 1. As a kid, what interested you? What sports did you play? Did you have any hobbies? As a kid I loved music, food, hiking and gardening, and I also loved to build model railroads. I ran track in high school and played a little basketball as well. First I wanted to be a musician, and then a doctor. I never really intended to become a flavor chemist. 3. What did you do once you were out of high school? This is where it gets complicated. At 17, my junior year of high school, on my birthday, and two days after Christmas, I was left without a home to hang my hat in, so I went to stay in my sister’s apartment. I tried to enroll in Sonora High School in La Habra, but my sister couldn’t afford to feed me so I got a job instead at Anaheim Truck and Transfer Docks so I could pay for food. It was an eye opening experience. 4. What happened in your life that sparked an interest in doing what you’re doing now? The one thing my uncle and grandfather taught me was how to make flavors and I was good at making food taste good. At 17 I started making flavors in my kitchen and starting experimenting with different combinations. As I became more confident in my ability to make flavor, I went out and decided to sell my flavors. This was hard for me because I was so shy and didn’t know how to talk to people. I was told no from someone who didn’t want my flavor, and I retreated to my apartment and didn’t leave the house for a week. It was then I realized I needed to make these sales so I could afford to buy food. I really needed to eat and I was so hungry. I went out and tried it again, and the very next time I sold something! My first sale was a blackberry concentrate that I made in my kitchen, I sold it to a "mom and pop” ice cream shop. At that moment it was the best day of my life. I knew that I succeeded. That day began the journey of Newport Flavors.